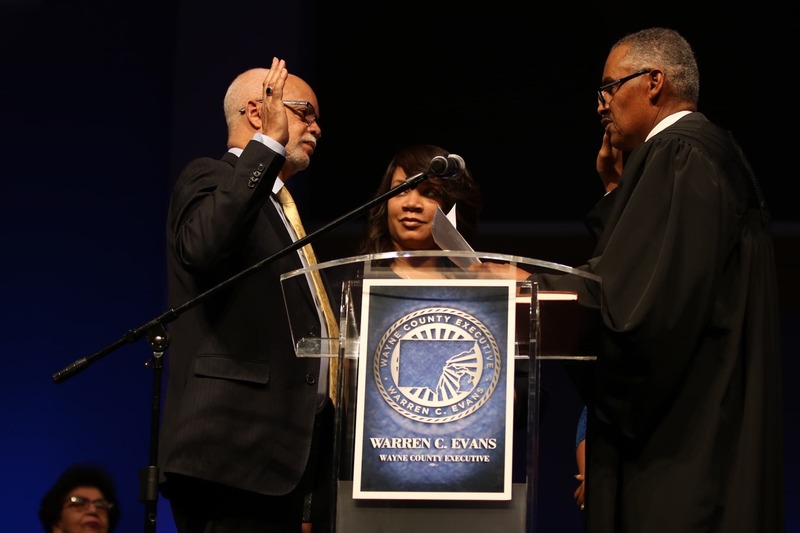 Warren C. Evans was sworn into his second term as Wayne County Executive. By any reasonable measure, the last few years have been a time of great progress for metro Detroit. Hardly a week goes by it seems without more indications of the city’s robust economic recovery. Rising household incomes and property values, investments in downtown development now accompanied by steep financial commitments to neighborhood revitalization, even the leveling off the crime rates. The Motor City is on the move. Yet, the city is not the only local government seeing progress after years of financial instability and stagnation. Quietly, and without much fanfare, Wayne County government has been experiencing its own recovery. It follows years of financial instability, tumbling credit ratings, and organizational woes that saw it on the brink of bankruptcy and harshly criticized from all quarters for the long-stalled jail project on Gratiot near Greektown burdened by such profound cost overruns that it was decided not to continue with the project. The fiasco came to symbolize the dysfunction in the Wayne County Executive’s Office at the time, and felt eerily like what had been going on in Detroit City Hall not too much earlier. He said thanks to the ingenuity of his young Chief Financial Officer Tony Sanders, who crafted his financial plan, the county was able to ride out the tide and is now on a firm financial footing for the first time in many years. Striking a $533M deal with businessman Dan Gilbert’s Rock Ventures to build the County a new state-of-the-art criminal justice center, with Rock responsible for any construction cost overruns. Abatement work underway, other work starting soon. Completion 2022. Demolishing of the failed jail at Gratiot, one of the region’s most notorious signs of government failure. Now ready for Rock to invest $250M plus in a mixed-use project at a gateway to the city of Detroit. Closing of the sale of the former McLouth Steel Plant in Trenton. The complex deal took, great collaboration with locals. Named Real Estate Deal of the Year by Crain’s Detroit Business. Bishop Edgar L. Vann, pastor of Second Ebenezer Church who hosted the inauguration said because of Evans low key style he does not get the credit he deserves for putting the county back on the right track. Referring to the stalled jail site as a “morass,” Vann said that was perhaps one of the more signature accomplishments of Evans tenure because the site stood as a monument to local government failure and was costing taxpayers money every day. “When you see him work out a solution to the morass of the jail site and negotiate with Mr. Gilbert and his group to come up with something equitable to the county, city and also agreeable to most people in the community … you realize he is a solution-oriented type of public servant,” he said. Evans, 70, said as he looks forward to his second term, besides bringing stability and growth to the county he also wants his legacy to be that of a leader who inspires other young African Americans to believe they can be leaders in their communities too.